A sophomore geography major at Vassar College, Alessandra Seiter is committed to combating oppression in its many forms through intersectional activism. She serves as co-president of the Vassar Animal Rights Coalition (VARC), Hen Press Coordinator and Contributing Writer at Our Hen House, and blogs at Farmers Market Vegan. When not writing, blogging, or organizing campus events, Alessandra enjoys cooking, baking, practicing yoga, and biking. Follow Alessandra on Twitter at @FarmerMarketVeg or on Facebook. You have a long, interesting story behind your veganism. Why did you initially become vegan? How and why did that motivation change and why are you vegan now? My veganism began at age 15, in the midst of an eating disorder, as my excuse to avoid foods high in fat and calories, such as dairy and traditionally prepared baked goods. I also latched onto veganism as an identity, for my personality had all but completely devolved into an obsession with food restriction. I experienced a profound transformation in my misguided veganism, though, with the help of Colleen Patrick-Goudreau’s Food for Thought podcast. Colleen’s words introduced me to the injustices humans perpetrate against non-human animals, and aroused inside of me a passion I had not felt since taking a disinterested stance toward anything unrelated to food. The new found moral drive behind my veganism shifted my mental focus from not consuming more than 25 grams of fat per day and onto a movement vastly larger than myself. Veganism allowed me to rekindle a healthy relationship with food; instead of regarding it as an enemy, I now saw it as a political tool through which to speak on behalf of our exploited non-human counterparts. Though it may sound melodramatic, I honestly feel that I owe my life to veganism. You can find the full story of my recovery and vegan evolution on Our Hen House. You began activism in high school. What inspired you to begin activism? What sorts of activism did you begin with? My high school did not have a vegan/animal rights group; indeed, I was one of perhaps two or three vegans in the student body (though that number has undoubtedly increased by now!). I decided to take advocacy into my own hands and, in response to my friends’ inquiries of “but what do you eat?,” I launched a vegan lifestyle blog entitled Farmers Market Vegan. There, I could reach my friends and beyond with my story of veganism, the profoundly positive implications of a vegan lifestyle, and the deliciousness of vegan food. Who has been your biggest inspiration? Have any books or philosophies or people been important to your development as an activist? I mentioned Colleen Patrick-Goudreau (a member of Vegetarian Youth’s advisory board) above, and still consider her integral to my vegan development. However, I also look to writer James McWilliams for help in combating the popular “humane meat” ideology, which I face frequently in my hometown and at college–both spaces boast active sustainable food movements, from which follows the “grass-fed, tucked-in-bed” meat trope. Additionally, I draw much inspiration from feminist vegan writers such as Carol Adams–author of The Sexual Politics of Meat–, philosopher Lori Gruen, and A. Breeze Harper–editor of Sistah Vegan. Their work has expanded my veganism into intersectional activism, helping me to realize that all forms of oppression perpetuate one another. What do you study in school and how does that enhance, improve and reflect in your activism? I’m a Geography major, which means that I examine how social, political, and economic processes play out spatially. Progressive geography functions at the crux of intersectional activism, seeing as feminist geographers concern themselves with holistically examining the causes and consequences of unequal social and spatial relations. My studies in geography include colonialism, imperialism, globalization, capitalism, neoliberalism, and a whole host of other processes and ideologies that have molded our world into the hub of inequality and ecological degradation that we know today. Geography, in the midst of all this, still manages to harbor a positive outlook on the world–or at least one that inspires geographers to take social and personal action in combating the various forms of oppression our world faces. Geography continues to give me a vocabulary to confront oppression in its many forms, and has also helped me to identify veganism as a necessary extension of, rather than the crux of, the driving force behind my ethics and practices–a commitment to egalitarianism and feminism. What is your favorite part of your work? Has there been a moment when you knew you were making a difference? I’ve had a deep love of cooking since an early age, when I would watch Food Network every day, help my mother make dinner every night, and visit the farmers market every weekend. Cooking delicious, satisfying, and nourishing vegan meals for non-vegans now plays a huge part in my activism, and every comment of “I could easily be vegan if you would cook all of my meals!,” or, “this cashew cheese tastes better than its dairy counterpart!” feels profoundly rewarding. I view it as immensely important for any vegan activist to provide non-vegans with quality vegan food in order to promote the lifestyle as one of abundance and flavor. What did you do in your internship with Compassion over Killing? How did it influence your activism now? I spent three months this past summer interning in Washington D.C. with the national animal advocacy nonprofit Compassion Over Killing. There, I and my current VARC co-president Katie helped to organize two large-scale VegFests, worked with local restaurants to implement more vegan options on their menus, hosted neighborhood feed-ins, and learned the intricacies of the post office (someone’s gotta ship all of that literature!). My internship with COK gave me an immensely valuable knowledge of event organizing, which I’ve frequently implemented as co-president of the Vassar Animal Rights Coalition. I’m confident that VARC would not have been nearly as successful in its event-hosting endeavors had Katie and I not had our summer experience with COK. How did you become co-president of Vassar’s Animal Rights Coalition? How have you changed the club with your leadership? What new projects have you started? After serving as an active member of VARC in my freshman year at Vassar, I was ready to take on a leadership role in the organization. My now co-president Katie and I agreed to take on the presidential endeavor together, and the previous VARC Executive Board enthusiastically supported our interest in doing so. Under my and Katie’s leadership, VARC has launched a vegan mentorship program called the Veggie Buddy System, hosted three successful and large-scale campus events (and are planning to host two more this semester), and continued past VARC campaigns such as Meatless Monday. I’ve also started catering all of VARC‘s events, and the homemade food present at these events has become rather ubiquitous on campus. What do you like/dislike about leading this group? It’s profoundly humbling to have all of the resources needed to host successful events right at my fingertips. As the leader of an organization on the Vassar campus, I have easy access to funding, event venues, a receptive audience, and an institution that attracts speakers and companies to donate their services and products to our group. This privilege has helped to make event organizing a less stressful endeavor. What I dislike is that, while VARC has a number of amazing visions for what we’d like to see the club do, we just don’t have the number of people or the time or energy to do it all. Some of our other visions include volunteering at nearby animal sanctuaries and shelters on a monthly basis, hosting more “tasting” events like our recent wine & cheese party (we’re thinking vegan pizza party and vegan ice cream sundae bar next), working more closely with our dining services to provide even more vegan options, and working toward a completely meatless Monday. Sadly, we have to prioritize our efforts, and it’s always difficult to see important projects falling by the wayside. Luckily, as one single group, we don’t have to do it all, and can rest assured that we’re making an important impact on the Vassar campus. What has been your greatest challenge leading this group? Probably the most stressful aspect of my presidency has been learning how to effectively manage my wide breadth of responsibilities–I’ve essentially had to become an expert in event programming, publicity, catering (I cater all of VARC’s campus events), and campaign organizing all while attempting to do it all successfully, and while being a student. Learning how to delegate tasks has been a hugely valuable lesson, and I’m eternally grateful that I have a strong Executive Board behind me, including my co-president Katie Maguire and secretary Rocky Schwartz. It also helps tremendously that past VARC presidents are still actively involved in the organization, and they serve as important resources of knowledge for how to manage the organization. My internship this past summer with Compassion Over Killing also proved indispensable in giving me a toolkit for event organizing, publicity, and community outreach. How is school activism important? How have you made a difference? As I mentioned before, most schools have a multitude of resources that make it easy for activist groups to have a great impact. It’s also hugely important to do activism on high school and college campuses, for research shows that young people are more likely to go vegan than their adult counterparts (though my mother went vegan at 57, so it’s never too late!). 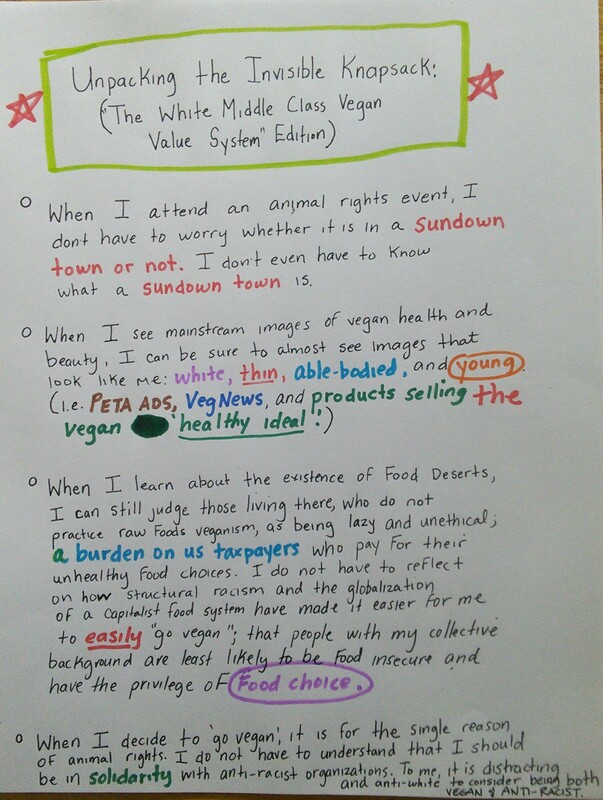 In your blog, The Farmers Market Vegan, you discuss many social justice issues. Aside from veganism, what are other social justice and environmental concerns we must we keep in mind when choosing what to eat? I always try to remember that eating vegan does not necessarily mean eating cruelty-free. Two animal-free foods–chocolate and palm oil–illustrate this point. The harvesting of most of the world’s cacao depends upon child slavery in West Africa, while the palm oil industry is responsible for a hefty amount of deforestation in Indonesia and Malaysia, which not only endangers wildlife (most notably orangutans), but also displace indigenous peoples who live among the palms. Additionally, it’s important to constantly interrogate the possibility of racism and sexism within the animal rights/vegan movement. A. Breeze Harper’s anthology Sistah Vegan begins to shed light upon these problems, and this image provides a taste of her work. How does veganism connect to other social justice movements? How does exploitation of animals connect to exploitation of others? Veganism is simply one of many movements that combats the oppression of a marginalized group–in this case, non-human animals. All forms of oppression–racism, sexism, speciesism, etc.–perpetuate one another. For truly intersectional activism, one must realize each movement as important in their own right, but also remember that they don’t exist in a vacuum. Anti-oppression movements must collaborate, working to understand one another on their own levels and not instituting a “hierarchy of oppressions” in which advocates attempt to argue that their movement has more value or merit than any other. Oppression is oppression, and we must fight it in all forms in the hopes of a more egalitarian tomorrow. What is your view on the locavore, humane-meat movement? While I think it’s great that the locavore movement has helped to inspire support of farmers markets, local economies, and healthy food, I see it as misguided. Transportation accounts for less than 15 percent of agricultural greenhouse gas emissions (the majority comes from production), so reducing food miles really doesn’t have as great of an impact as touted. Additionally, an infinitesimal amount of people actually eat completely locally, so calling oneself a “locavore” makes people feel good about their food choices without questioning them beyond whether or not they got them at the farmers market. As for the myth of “humane meat,” I see all of the morality touted behind it as moot once one betrays the animal whom they’ve raised and subjects them to premature death. For more comprehensive thoughts on these movements, I’d highly recommend reading James McWilliams’ work. My favorites recipes are the two that I make every day. I start every morning off with a green smoothie of an apple, a cup of frozen berries, a scoop of vegan protein powder, a large handful of kale, a knob of fresh ginger, and a cup of Edensoy Extra soy milk, all blended up and topped with homemade granola. During lunch, I enjoy a hearty salad of mixed greens, chopped raw veggies, whole grains, beans, nuts, alfalfa sprouts, and dulse flakes all tossed in my infamous Liquid Gold Dressing and topped with a generous scoop of sauerkraut. Do you have any other advice for youth activists? The most important piece of advice I can give is to network. Having a strong community of driven individuals is indispensable in making a large impact with activist work. I would also recommend getting to know your community’s resources–where can you get funding? Where can you host events? What other groups can you collaborate with? Knowledge of the resources available is key. When I’m not writing or organizing VARC events, I enjoy cooking, baking, practicing yoga, biking, and reading.